Grease and flour 10-inch Bundt pan. Cream butter and shortening with sugar. Stir in milk and flavorings, and add flour sifted with salt and baking powder. Mix on low until just incorporated, scraping down once or twice. 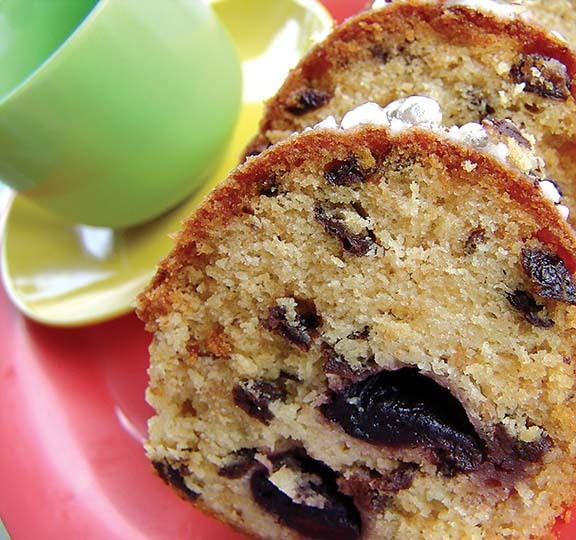 Add cake crumbs, cherries and raisins. Fold in until just incorporated (mixture should fall from spoon easily). Spoon batter into pan. Bake for about 1 hour or until tester inserted into the centre of the cake comes out clean. If desired, pour rum butter sauce over cake and/or glaze before serving.